Kate Nasser will help your team change and grow. In leadership, teamwork, and customer service experience, Kate's people skills sessions move all from inspiration to action! Leaders, are you making a needless leadership people skills mistake? Are you mislabeling high volume communicators as nervous because you don’t like the volume of questions they ask? Although this may seem like a harmless mistake to you, it isn’t. It’s harmful. It creates the following trouble for you and the organization. Leadership People Skills Mistake: Do You Mislabel High Communicators as Nervous? Image by Lucia Sanchez via Flickr. Image by Lucia Sanchez via Flickr Creative Commons License. Are You Making This Leadership People Skills Mistake? Demoralize and anger those you target. Ignore the potential business risks that high volume communicators are raising. Create a please the leader culture vs. a results-oriented one. Silence employees and their contributions. Make yourself look like a weak leader as you fail to communicate the business needs vs. what you don’t like. Leaders, instead of mislabeling high volume communicators as nervous, consider what the truth may be. May be Expressives on the personality social style scale. In other words, it’s as natural for them to communicate a lot as it is for other types to communicate less. Are trying to clarify what you left unclear. Are high achievers who go at tasks with full energy. Think of issues that you don’t and so they ask more questions. Communication is the lifeblood of a successful organization. In fact, during the challenging times of change, lack of communication is the #2 reason why change efforts fail. Instead of demeaning high volume communicators as nervous, assess what value they bring. If needed, coach them in adapting their high volume communication style to other factors like timing, conciseness, and other people’s styles. This approach is far better than making a needless people skills mistake. ©2019 Kate Nasser, CAS, Inc. Somerville, NJ. I appreciate your sharing the link to this post on your social streams. However, if you want to re-post or republish the content of this post, please email info@katenasser.com for permission and guidelines. Thank you for respecting intellectual capital. Kate Nasser, The People Skills Coach™, delivers coaching, consulting, training, and keynotes on leading change, employee engagement, teamwork, and delivering the ultimate customer service. She turns interaction obstacles into interpersonal success. See this site for workshop outlines, keynote footage, and customer results. Get more inspiration and actionable tips for high engagement results! 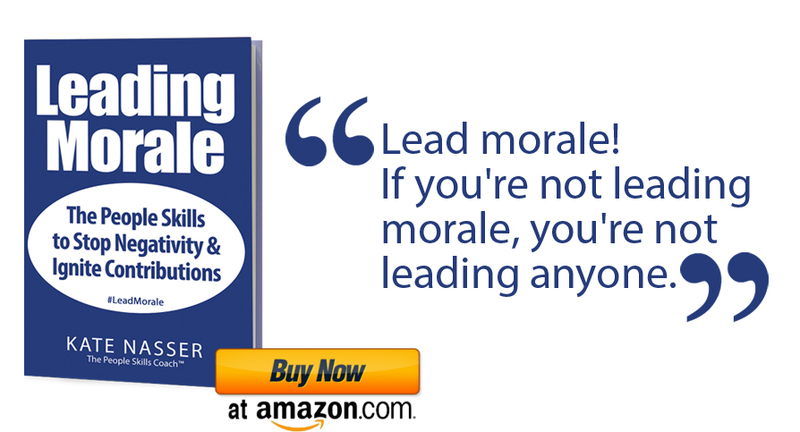 Buy Kate Nasser’s new book Leading Morale (Amazon.com). “Communication is the lifeblood of a successful organization”. This line added a great tool to my leadership toolkit to occupy the unconquered space in the minds of my followers. Many thanks Farrukh …. and you used an interesting phrase “unconquered space” … Would love to hear what you meant by that! We will not sell, share, or spam your email at any time. Your email will be used only to send you alerts of new blog posts. © 2019 Kate Nasser, Somerville, NJ 08876 USA. All worldwide rights reserved.